There is something completely magical about a blanket of white snow – and the rescued horses in this video seem to think so, too. 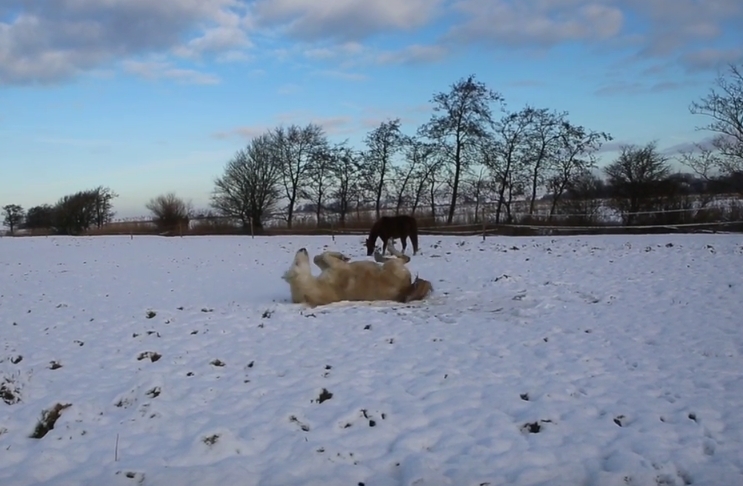 These horses are living the life at Hof Butenland, a farm animal sanctuary in Germany. Lolle, Kaspar, Polly, and Cello, have all been rescued from dismal conditions where they were forced to work in entertainment. According to the sanctuary, some of these beauties were saved from the horse racing industry, where they were subjected to cruel, painful abuse in order to put on a show for gamblers. Now, they live free from harm at the sanctuary where they are loved and cared for. There was a time when they wouldn’t have had the freedom to enjoy the wonder of a snow day, but now the horses are able to run, frolic, play, and even show off their somersaults in their new home. If you’re feeling winter’s cold, this video will completely warm your heart. Responses to "Rescued Horses Frolic in the Snow Like Puppies"